Mosio is the most effective text messaging software for helping research sites improve patient recruitment and retention. Mosio enhances study staff’s ability to recruit and enroll more patients, empower patient communications, and resolve study visit no-shows. Creating new operational efficiencies, Mosio helps avoid voicemail and “phone tag” for appointment reminders/scheduling, enhancing the effectiveness of your patient database through interactive two-­way text messages directly to patients’ mobile devices. You can utilize our secure, web-based interface or we’ll work with you to integrate text messaging into your existing patient databases and systems, making it easy for your staff to send alerts of new studies and automate the sending of appointment reminders to help ensure patients show up to their study visits, prepared and on-time. Study Alerts reach your patients wherever they are to inform them about your new studies. 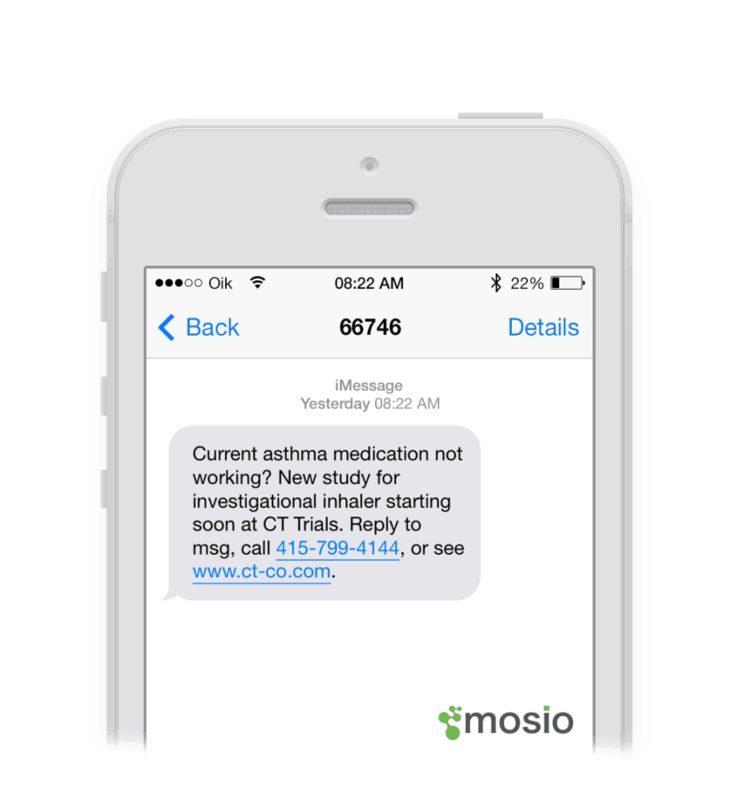 Mosio’s Study Alerts can help you verify and convert your existing patient database into a list of patients that can receive text messages for clinical trials. With Mosio’s Patient Database Initiation Program, you can be assured that your organization is equipped with tools for communicating effectively with patients on their mobile devices. Mosio’s technology allows you to leverage your patient database, so that you can run inclusion/exclusion criteria searches and send targeted messages only to those patients based on your study requirements. Eradicate email and voicemail. Text messaging is proven to recruit and enroll patients, and is much more efficient, scalable and effective than email and voicemail. Show patients you care. Send links to patient newsletters, and offer customized health tips based on specific disease indications. Engage patients and establish trust. Appointment Reminders are sent automatically, asking for patients to confirm or cancel, keeping lines of communication open. Appointment Reminders. 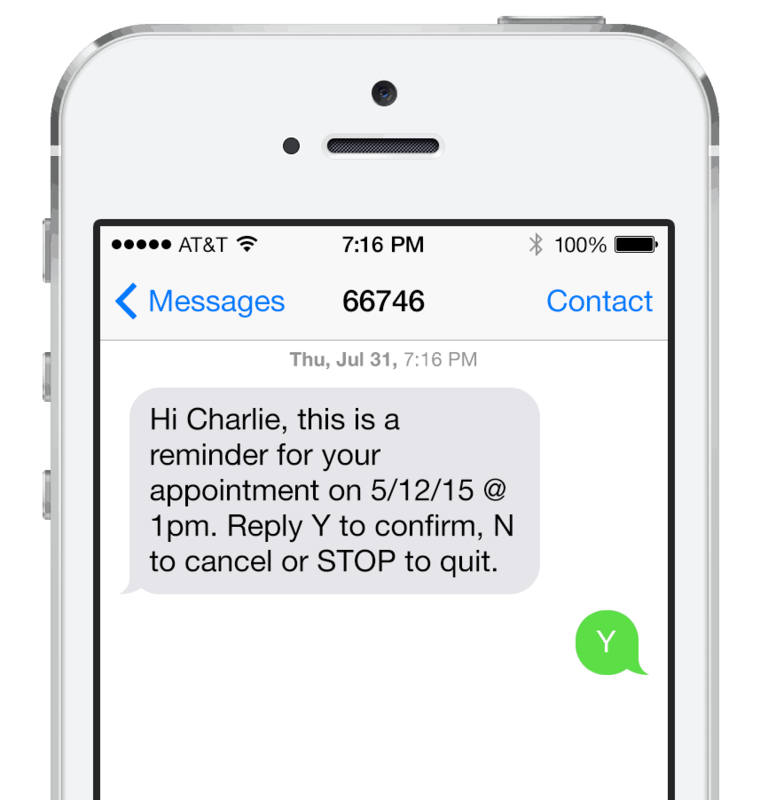 Leverage your legacy scheduling system to send personalized text message reminders to patients of upcoming study visits, and confirm patient attendance with two way text messaging. Be notified immediately of cancellations, and rapidly reschedule patient visits. Minimize patient dropout rates, and improve scheduling efficiency. Prepare Your Patients. Remind patients of specific study procedures during study visit confirmation. Improve trial compliance and patient adherence. Two-Way TextChat enables you to communicate with patients via a virtual “talk or text” number in your site’s area code. 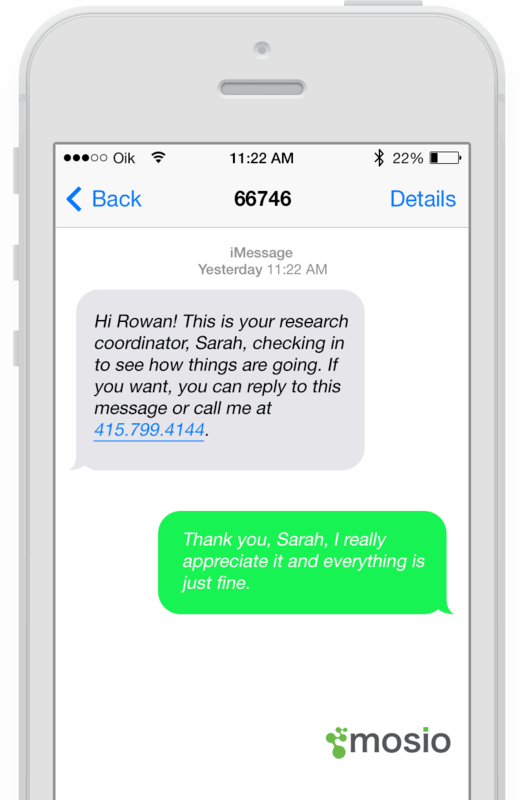 With Mosio’s Two-Way TextChat, you can customize scripted responses and automate conversations with patients to grab their attention when they contact your research center. Customize auto-responders based on the time of day and week, so patients stay engaged during and after business hours. Talk or Text Numbers. With Talk or Text functionality, patients can communicate with you the same way they do with friends and family. Voice calls on the number forward to your recruitment office or call center and text messages are received and responded to via your Mosio account. Captivate patients at any time of day. Applied Clinical Trials featured a scientific case study that evaluated Mosio’s two way text messaging solution on patient recruitment and enrollment. Results have statistically verified that an increase in text messages also increased patient enrollment rates at a study site during a vaccine clinical trial. 1,541 text messages were sent to patients, and the study site screened 795 patients and enrolled 265 patients within eight weeks. “We had an amazing response! The minute we sent the text, we would immediately get a lot of calls. It was not double, not, triple, but five times the response, even with less people contacted (compared to e-mail),” Mazen Zari, Cofounder, acting VP and Director of Operations, Johnson County Clinical Trials. Character counter – craft text messages that are the proper length without having to use “txtspeak” abbreviations.